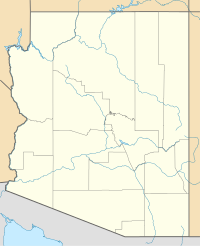 Navajo Nation, Apache County, Arizona, U.S. Roof Butte (Navajo: Adáá dikʼá "Roof shaped mountain on the run") is a peak in the Chuska Mountains in Arizona, United States. Roof Butte is the highest peak of the Chuska Mountains which run in a north-northwest direction across the Arizona-New Mexico border. Roof Butte is a visible butte for miles around. The butte has an elevation of 9,787 feet (2,983 m). A manned-lookout tower is located on Roof Butte. Two funnel shaped explosion volcanic pipes formed the flattish summit of Roof Butte, and a low lava dome caps one nearby peak. Access to the Navajo Nation requires a permit. ^ a b "Roof". NGS data sheet. U.S. National Geodetic Survey. Retrieved 2013-01-25. ^ "Roof Butte, Arizona". Peakbagger.com. Retrieved 2013-01-25. ^ "Hiking & Camping Rules". Navajo Nation Parks & Recreation. Retrieved 2014-02-08. "Roof Butte". Geographic Names Information System. United States Geological Survey. This page was last edited on 3 May 2018, at 23:01 (UTC).